I received the following product in exchange for review. All thoughts are my own. I love this collection it has so many beauties to treasure. These are available at Walgreens for $1.99 and I'm on the hunt for Tinsel Town and Spiked Ice. 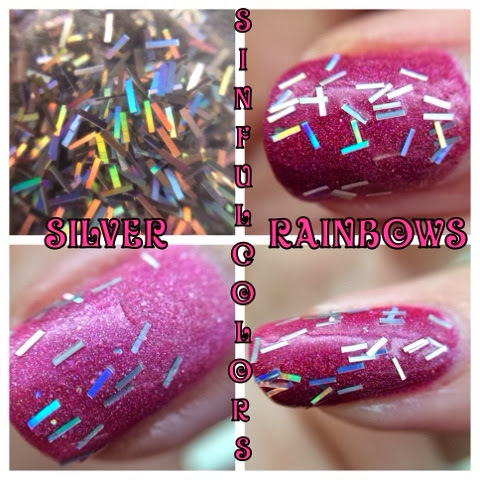 I got the chance to review 2 beauties from the collection Silver Rainbows and Pink Icicles. First I want to share is Silver Rainbows. 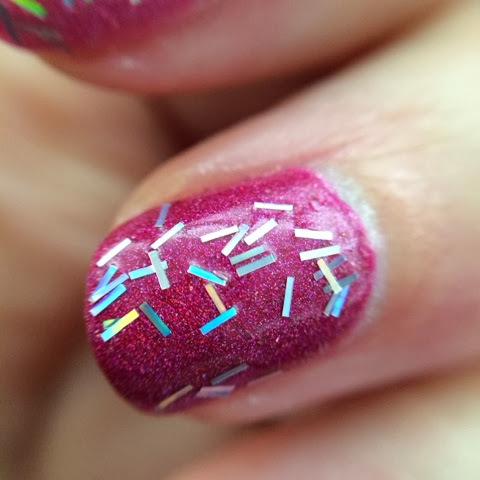 I really love this holo goodness filled bar glitter. It really is a rainbow and is beautiful. 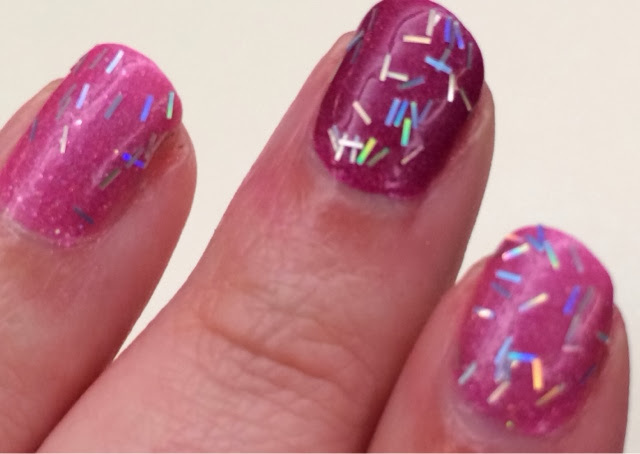 This polish will leave people asking "where did you get that polish!!!?" 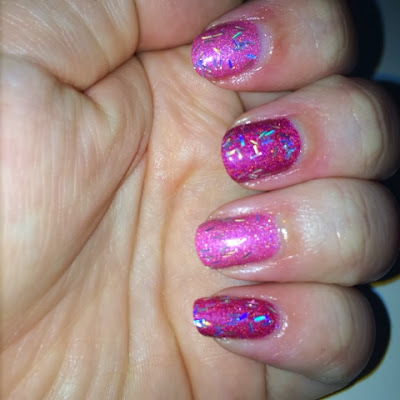 I only used 1 coat over 2 great Holo polishes from Dainty Digits Polish. The base is not goopy or hard to work with and dried quickly. Next up is Pink Icicles. 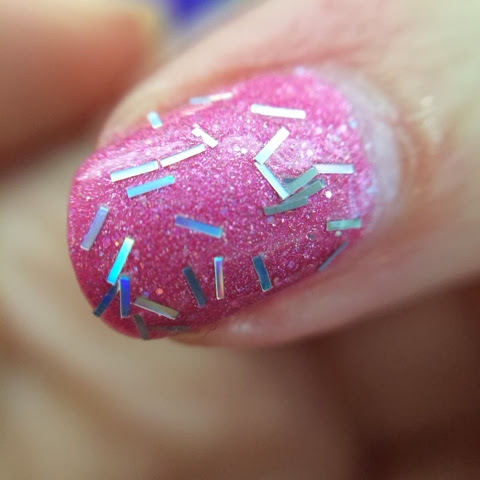 This glitter is a mixture of white,black,and hot pink glitter. It's hard to get a shot that's true to colors of this polish but is gorgeous as well!!! I used 1 coat over Zoya's Ali. The pink in this polish appears more red over Ali and I think it would look better over a lighter pink or another color all together. The application on this one is amazing as well and dried in under 2 mins. Do you have any of this collection? Which colors do you have or looking for? 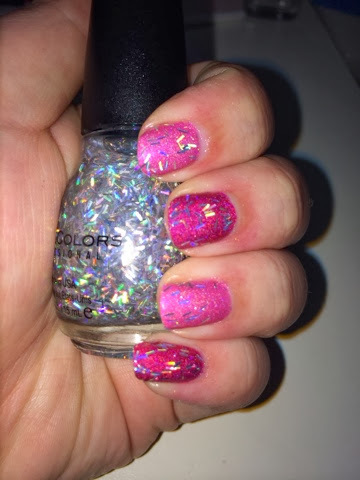 I think these glitter polishes would be great for a party. Think New Years Eve, or a birthday party. So cute. I'll have to keep an eye out for these. That pink icicles color is amazing - how fun would that be with a sassy black dress and your nails are the accessories?!?! The second one is super cute. Some of my favorite colors. They look amazing. I would love this on my nails. I may give it a try. Thanks for sharing.